This species is almost unheard of in the western hobby. Typical habitat in the Yongdokoship River drainage, Yongdok county, Gyeongsangbuk-do (North Gyeongsang province), South Korea. yongdokensis: named for Yong-dok-gun in the Yongdokoship river system, Korea, type locality of this species. All Iksookimia species are endemic to Korea, with I. yongdokensis native to the eastern province of Gyeongsangbuk-do (North Gyeongsang), South Korea, where it’s known from the Hyongsan, Yongdokoship, Chuksan and Songcheon river drainages. 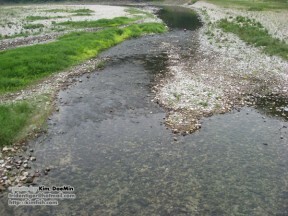 Type locality is given as ‘Yongdokoship River, Yongjeon-ri, Dalsman-myon, Yongdok-gun, Kyongsangbuk-do, Korea, 36°23’47″N, 129°15’20″E’. Most frequently observed in sluggish, shallow(< 1 m deep) habitats with substrates of sand or pebbles in mid-to-upper sections of rivers. It’s been collected alongside several other species including Squalidus multimaculatus, Phoxinus oxycephalus, Carassius auratus, Nipponocypris temminckii, Misgurnus anguillicaudatus and Rhinogobius brunneus. An aquarium with base dimensions of 100 ∗ 30 cm should be the smallest considered. Base substrate can either be of gravel, sand or a mixture of both to which should be added a layer of water-worn rocks and pebbles of varying sizes, and perhaps some driftwood roots and branches. Since it requires stable water conditions this species should never be added to a biologically immature set-up, and regular partial water changes are essential. Chiefly a micropredator feeding on chironomid larvae and benthic inveretebrates in nature. In the aquarium it will accept sinking dried foods but should also be offered regular meals of small live and frozen fare such as Daphnia, Artemia, bloodworm, etc. A varied diet is key to maintaining it in the best of health. Iksookimia spp. are peaceful both with one another and other fishes and there exist no reports of them harming tankmates though they may prey on eggs or fry. I. hugowolfeldi makes an excellent addition to communities of suitably-sized stream fishes. Good tankmates include small, peaceful cyprinids plus current-loving loaches from genera such as Gastromyzon, Pseudogastromyzon, Beaufortia, Sewellia, and peaceful nemacheilids. Rheophilic gobies from genera including Sicyopterus, Stiphodon, Rhinogobius, and Lentipes can also make interesting additions to this kind of community. Territorial or aggressive bottom-dwellers such as most substrate-dwelling cichlids and some nemacheilid loaches are less-suitable companions. Adult females are typically heavier-bodied and a little larger then males. In mature males the pectoral fins become extended, particularly the second ray, and there is a thickened structure known as the lamina circularis at the base. The size of the lamina circularis is useful in identifying this species since it’s much smaller than in other members of the genus. Presumably a seasonal spawner in nature but hasn’t been bred in captivity as far as we know. This species may not yet have reached the western hobby but is sometimes traded in Korea and Japan, and is one of five currently-recognised members of the genus alongside I. koreensis, I. longicorpa, I. pumila and I. yongdokensis. Among them it’s most similar to I. longicorpus and I. hugowolfeldi but can be distinguished by the following combination of characters: body patterning consisting of 9-13 dark vertical bars along the flanks plus a small dark spot at the base of the upper caudal-fin lobe; no black blotch or markings posterior to the operculum; reduced lamina circularis in males; interorbital width measures 14.7-17.8% of head width (vs. 10.7-14.3%); 13-14 gill rakers (vs. 15-17); 17-20 caudal vertebrae (vs. 20-24). It appears that I. hugowolfeldi, I. longicorpus and I. yongdokensis form a distinct biogeographic lineage to I. koreensis and I. pumila, with the former group distributed to the south of the Taebaek and Noryeong moutnain ranges and the latter to the west. This is further evidenced by the fact that the lamina circularis in males of the southern group is rounded in shape while that of the western species is more elongate. Iksookimia was erected by Nalbant (1993) to accommodate five species of Cobitis from Korea. The description of I. yongdokensis in 1997 increased the number of members to six but C. choii was later reassigned to its original status. We haven’t seen Nalbant’s paper but a brief summation by Kim and Park (1997) states that he separated Iksookimia spp. on the basis of a combination of characters including: elongate first pectoral ray; relatively stout body form; longer barbels; more developed mental lobes; reduced sub-ocular spine; scales with a larger ‘focal’ area; absence of four ‘Gambetta’ pigmentation zones on the flanks. This analysis was supported by Kim (2009) who noted the same characters while adding that the lateral line does not extend beyond the pectoral fins and that the second pectoral ray has a ‘beak-like tip’ while also placing Cobitis pacifica into Iksookimia. In the most recent study Iksookimia was found to represent a polyphyletic grouping comprising up to three separate genetic lineages. Iksookimia yongdokensis, a new cobitid fish (Pisces: Cobitidae) from Korea with a key to the species of Iksookimia. 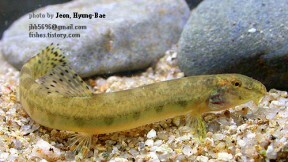 A review of the spined loaches, family Cobitidae (Cypriniformes) in Korea.